CenTrak’s rapid growth, and focus on the Western US market, is impetus for opening a new office in Menlo Park, CA. (Newtown, PA – January 17, 2012) CenTrak, a leading provider of Real-Time Location Systems for healthcare, is pleased to announce the opening of its new West Coast office in Menlo Park, CA. The expansion will help CenTrak support its growing list of west coast healthcare partners and end users. “The new office provides a regional facility to help us better serve our customers on the West Coast. It will function as a destination for meeting partners, customers and prospects and as a ‘showroom’ for our latest technology. We have set-up a fully functioning deployment of our Hybrid Gen2IRTM and Active-RFID RTLS in over fifty rooms, so we can demonstrate the technology in use,” Dr. Ari Naim, CEO and Founder of CenTrak. 2011 was another breakthrough year for the company, as the number of CenTrak installations grew into the hundreds. With over 300,000 tags deployed in the past four years including tens of thousands of active patient, staff, and temperature tags, CenTrak has positioned itself as one of the clear leaders in the healthcare RTLS industry. “We are experiencing significant momentum at this point in the market’s evolution. By exceeding our customers’ expectations – typically due to our system’s accuracy, speed, ease of installation/maintenance and affordability – we are receiving positive feedback, new referrals and more opportunities,” indicated Dr. Naim. 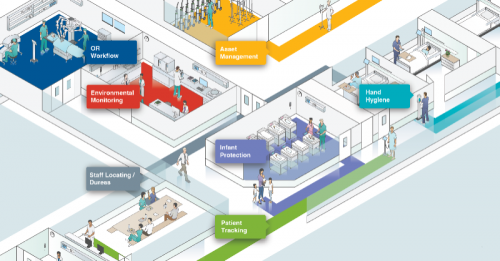 “The healthcare RTLS market is rapidly evolving. Hospitals are forgoing basic tracking projects in exchange for real value from integrating certainty-based room-and bed-level location data with traditional Hospital Information Systems and new RTLS workflow applications. CenTrak’s patented Gen2IRTM puts us in prime position to leverage the trend of location-enabling the applications hospitals already own,” indicated Wil Lukens, Senior Vice President of Sales and Business Development for CenTrak. Clinical-Grade Locating™, Clinical-Grade RTLS™, and CenTrak® are registered trademarks of CenTrak Inc.
Centrak is currently deployed at world-class healthcare facilities in the US, Asia, Europe, Australia, New Zealand, and the Middle East.